You will need some red, black, grey, white, yellow and brown fondant. I make my own but any brand will do and you can either buy it pre-colored or dye your own with food color. 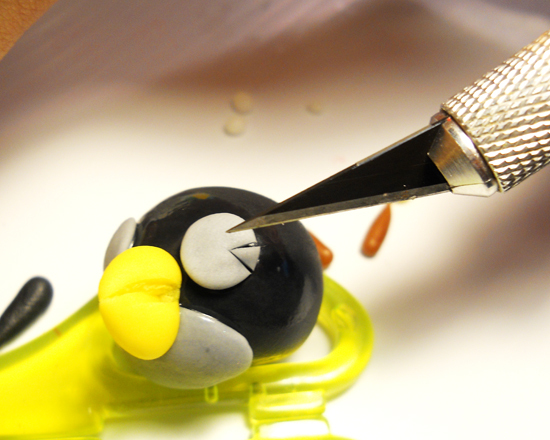 You will also need some small scissors, an x-acto knife and a skewer (or something to poke a hole). The red bird is a circle. Take a small amount of fondant (about the size of a hershey’s kiss) and roll it into a ball. Poke a hole into the back side. This is where the tail will go. I usually let the body dry for a day before adding details so its firm but you can make it all in one day too. You will need a few more shapes for the bird. Some white for the belly and the eyes. Som black for the tail and the eye brows. Some more red for the feathers on top and some yellow for the beak. I usually make these pieces as I need them but have them all here for you to see. 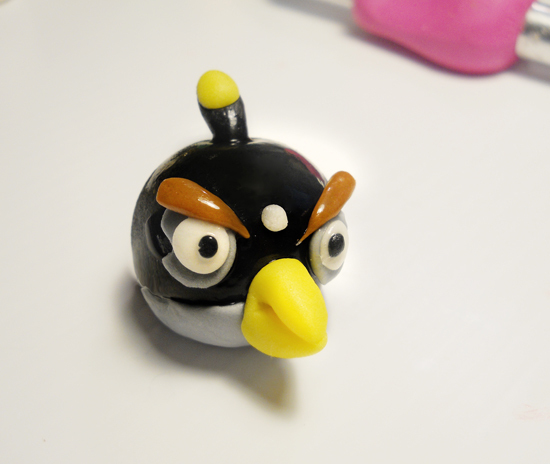 The first thing I do is add the belly and the beak. You will be doing all your “gluing” with just a dab of water from a small paintbrush. You don’t need a lot of water. Less is more. I brush the orb with some water, push on the belly. 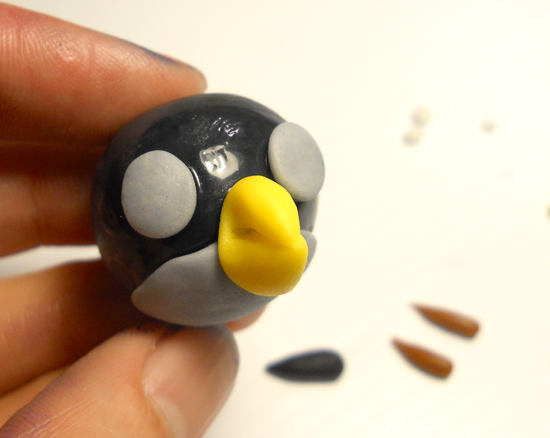 Then I put the beak onto the belly so it overlaps slightly. I use the scissors to cut the beak so it looks like a birds beak (note* make sure you sterilize your tools before using them for food). Then I add the eyes by adding more water and then pushing on the small white orbs so they are pretty flat. These eyes should be pretty close together. Then comes the eyebrows. They should be pretty small and touch in the center. Next is to glue on the tail. Again, use a touch of water and then insert the tail. 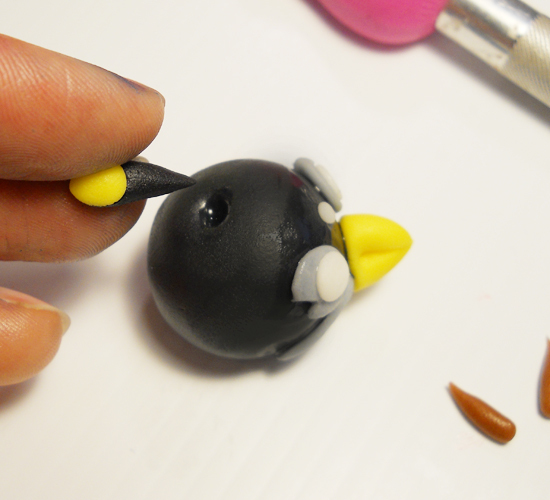 You make the tail by forming a tear drop shape out of the fondant then squishing it flat. I use my x-acto to push dents into the end to make it look like feathers. (cartoony feathers). Thats all there is to the red bird! 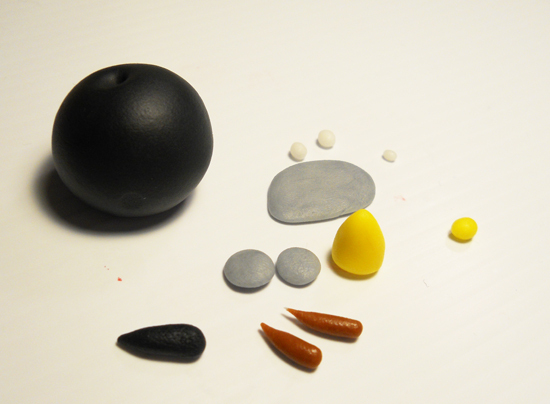 The black bomb is next and he has similar features but there are a few differences that I will spend more time on. 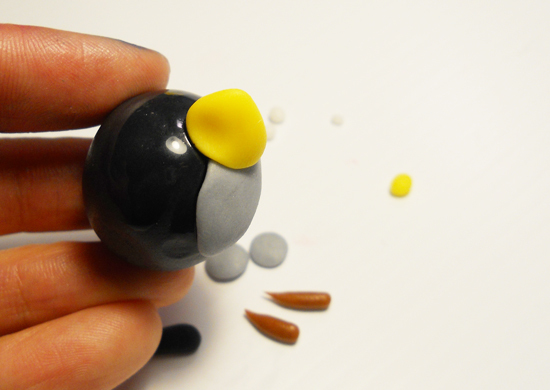 The black bird starts out with a ball about the same size as the red bird and this time the hole is on the top. You will need some grey for the belly and the eyes. Some small white pieces of fondant. 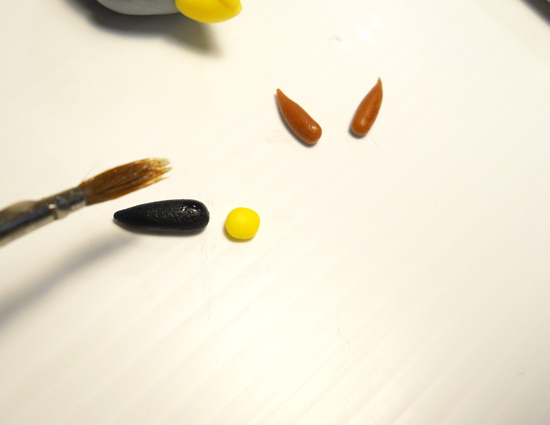 Two pieces of yellow fondant for the fuse and the beak. Another piece of black for the fuse and some brown for the eyebrows. 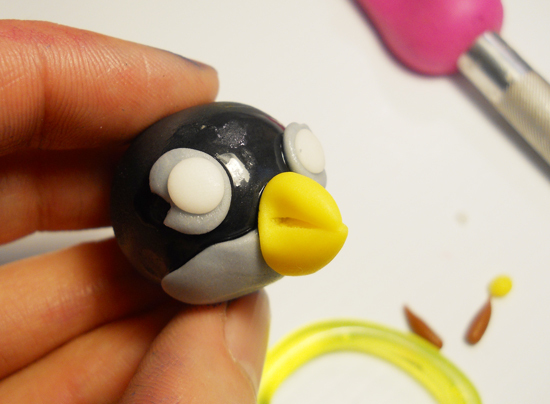 Again, I start with adding the belly and the beak and using the scissors to cut the beak. The eyes on the black bird are the most complicated out of all the birds but the cutest in my opinion! You start by attaching the grey circles. Make sure these are fairly large but not too big. You need enough room to put white on top but you dont want him to look weird by making them be too big. Then you take your x-acto blade and cut out a small triangle from the sides of the grey circles and remove them carefully with the tip of the blade. Next step is to put the fuse together. 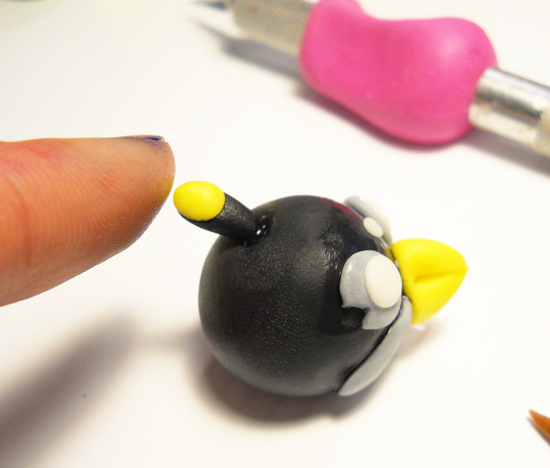 Take a small piece of black and roll it out and a small piece of yellow fondant for the “lit” part of the fuse. Glue them together with a dab of water. Put a little water in the top hole and then place the fuse inside. make sure it’s standing straight up! 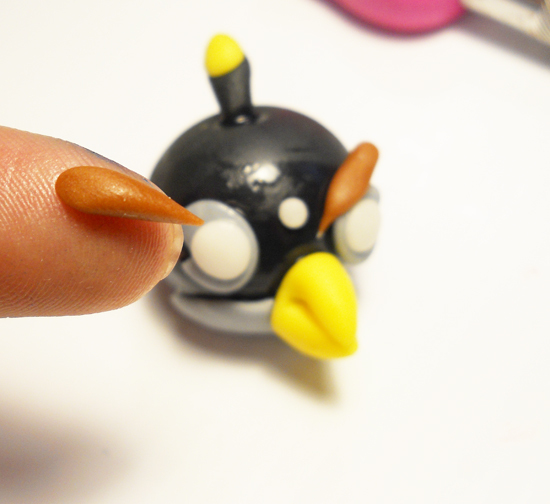 Lastly glue on the eyebrows and the dot for the forehead. 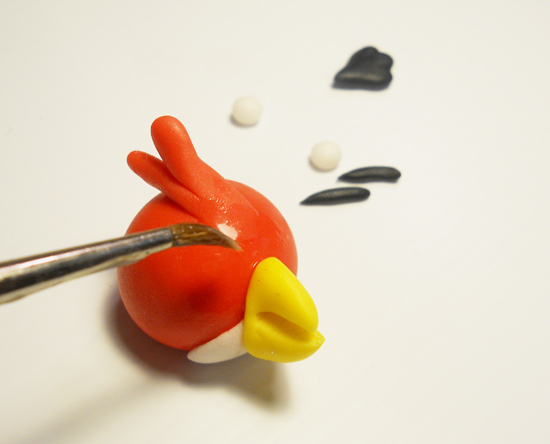 I usually draw on the pupils for this guy with an edible marker but you can use tiny dots like we did for the red bird.